Children in the UK experienced a rise in well-being between 1994 and 2008, but this appears to have stalled and may have begun to reverse. Around 80% of children are ‘flourishing’: they are satisfied with their lives and find them worthwhile. 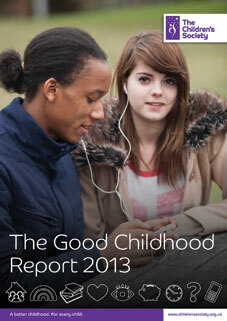 14 -15 year-olds have lower well-being than younger or older children for most aspects of their lives. Children with low well-being are over 20 times less likely than other children to feel safe at home, eight times more likely to say that their family does not get along well together and five times more likely to report having recently been bullied. Children who lack five or more items on the Society’s deprivation index are 13 times less likely to feel safe at home and six times less likely to feel positive about the future. The amount of harmony, support and parental control within families all have a significant impact on children’s well-being. Children’s levels of well-being can be changed and improved by external factors. Between the Cracks from the RSA makes sad reading, this time on the impact of school moves on attainment. Only 27% of pupils who move schools three times or more during their secondary school career achieve 5 A* to C GCSE’s (national average of 60%). SATs results for KS2 children dropped 12% following one in year move, 17% for two and 25% for three. Children who move school in-year already face significant disadvantage: 46% are eligible for the pupil premium (national average of 25%) and 29% have a special need.